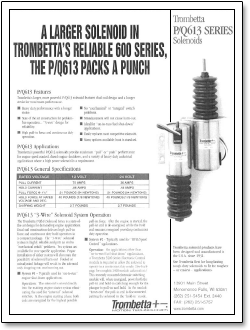 The Trombetta P610-A1V12 / A1V24, offered in both 12V and 24V is a pull type solenoid built to withstand high temperature and high vibration environments. The coils are fully encapsulated and able to withstand a variety of environmental conditions. 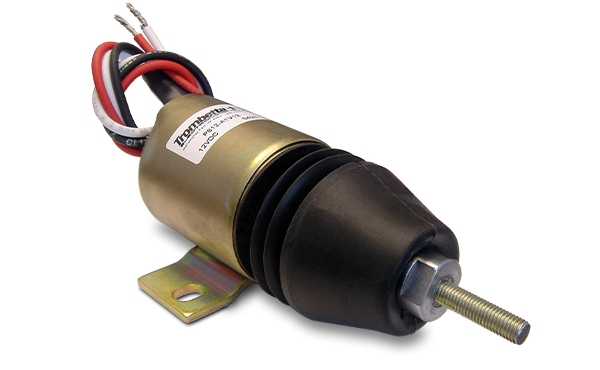 This side-mount, three-wire solenoid uses no spring return and has a maximum stroke of 1". This solenoid provides 15 lbs net pull force and 23 lbs net hold force. The 12V model is rated at 48 “pull-in” amps and 1.0 “hold” amps, while the 24V models is rated at 25 “pull-in” amps and 0.48 “hold” amps. Typical applications include mobile and stationary equipment, including lawn and garden equipment, compressors, generators and construction equipment. For many applications a spring return is necessary. 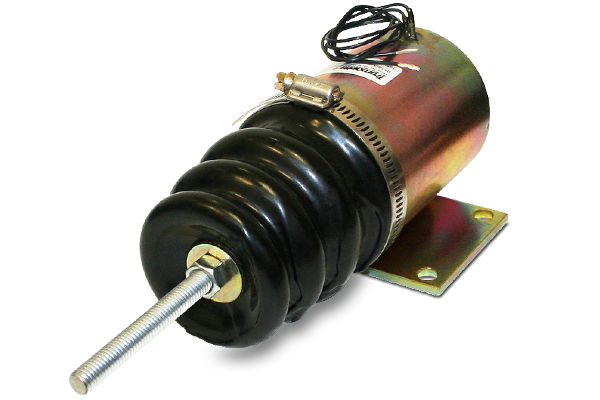 The P610-B1V12 / B1V24, also available in 12V and 24V, utilizes a “light” spring return. With this addition the solenoid provides 13 lbs net pull force and 16.5 lbs net hold force. The 12V model is rated at 48 “pull-in” amps and 1.0 “hold” amps, while the 24V models is rated at 25 “pull-in” amps and 0.48 “hold” amps. The P610-C1V12 / C1V24, available in 12V and 24V, utilizes a “heavy” spring return and provides 12.5 lbs net pull force and 13.5 lbs net hold force. The 12V model is rated at 48 “pull-in” amps and 1.0 “hold” amps, while the 24V models is rated at 25 “pull-in” amps and 0.48 “hold” amps. 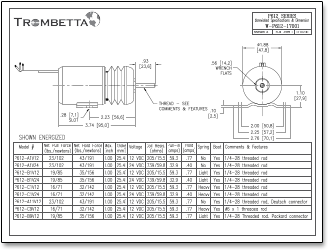 MurCal sells all the above variations of this solenoid in our online web store. 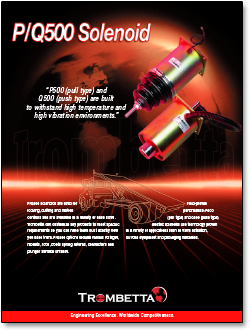 The Trombetta P612-A1V12 is a 12 volt pull-type solenoid built to withstand high temperature and high vibration environments. 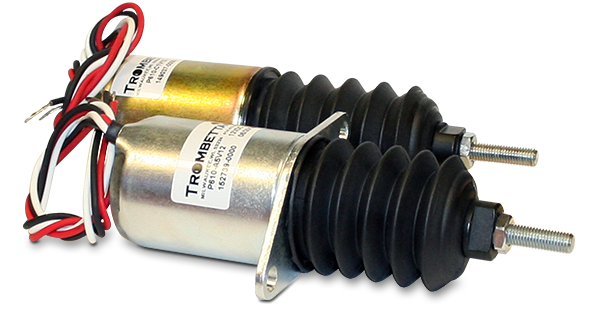 This side-mount, three-wire solenoid uses no spring return and has a maximum stroke of 1". This model provides 23 lbs net pull force and 43 lbs net hold force, and is rated at 59.3 “pull-in” amps and 0.77 “hold” amps. 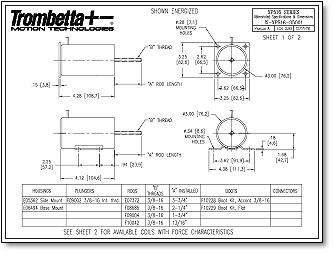 For connections, the 1/4-28 threaded rod is standard. Like the P610 shown above, typical applications include mobile and stationary equipment, including lawn and garden equipment, compressors, generators and construction equipment. 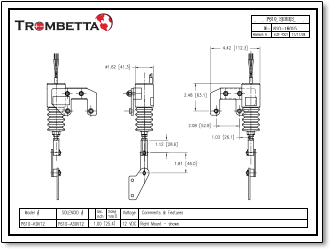 For many applications a spring return is necessary. The P612-B1V12 utilizes a “light” spring return. With this addition the solenoid provides 19 lbs net pull force and 35 lbs net hold force, and is rated at 59.3 “pull-in” amps and 0.77 “hold” amps. The P610-C1V12 utilizes a “heavy” spring return and provides 16 lbs net pull force and 32 lbs net hold force, and is also rated at 59.3 “pull-in” amps and 0.77 “hold” amps. MurCal sells only the 12V models with the above spring options in our online web store. 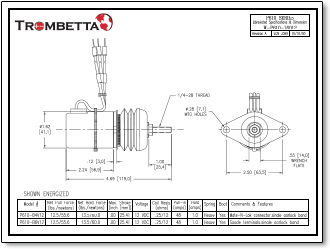 The Trombetta P613-A1V12 / A1V24, offered in both 12V and 24V is a pull type solenoid built to withstand high temperature and high vibration environments. The coils are fully encapsulated and able to withstand a variety of environmental conditions. 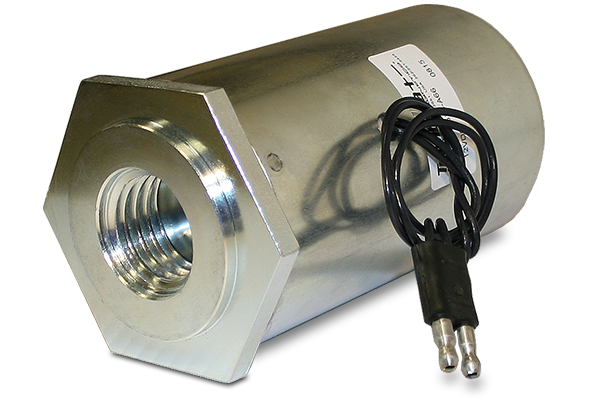 This side-mount, three-wire solenoid uses no spring return and has a maximum stroke of 1.5”. 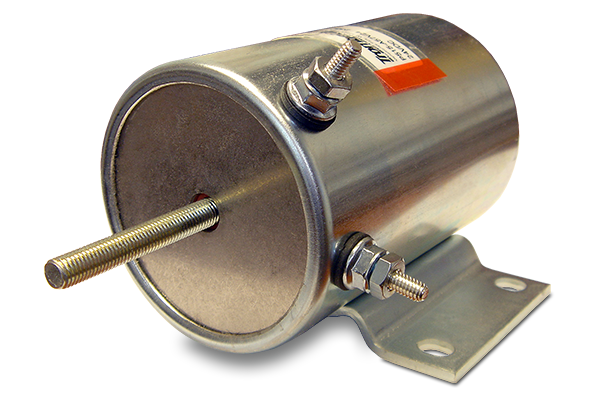 This solenoid provides 21 lbs net pull force and 40 lbs net hold force. The 12V model is rated at 69.1 “pull-in” amps and 0.88 “hold” amps, while the 24V models is rated at 36.8 “pull-in” amps and 0.48 “hold” amps. Typical applications include mobile and stationary equipment, including lawn and garden equipment, compressors, generators and construction equipment. 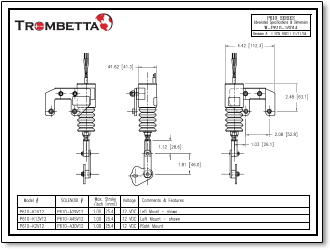 For many applications a spring return is necessary. 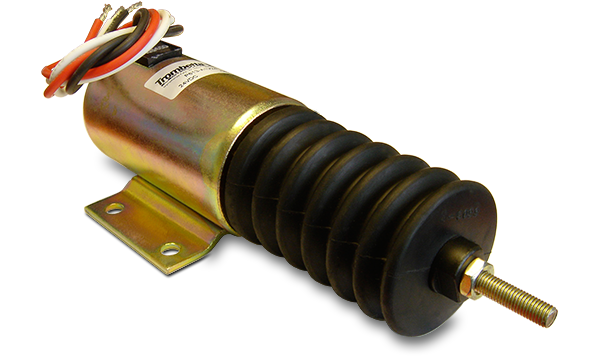 The P613-B1V12 / B1V24, also available in 12V and 24V, utilizes a “light” spring return. With this addition the solenoid provides 21 lbs net pull force and 33 lbs net hold force. The 12V model is rated at 69.1 “pull-in” amps and 0.88 “hold” amps, while the 24V models is rated at 36.8 “pull-in” amps and 0.48 “hold” amps. The P613-C1V12 / C1V24, available in 12V and 24V, utilizes a “heavy” spring return and provides 20 lbs net pull force and 29 lbs net hold force. 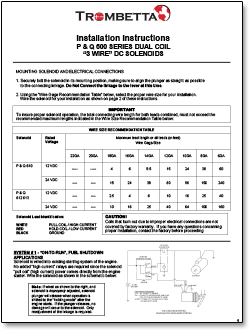 The 12V model is rated at 69.1 “pull-in” amps and 0.88 “hold” amps, while the 24V models is rated at 36.8 “pull-in” amps and 0.48 “hold” amps. 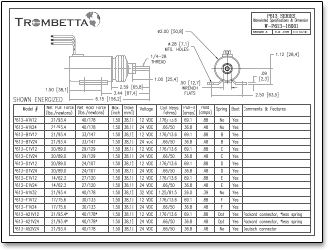 MurCal sells all the above variations of this solenoid in our online web store. 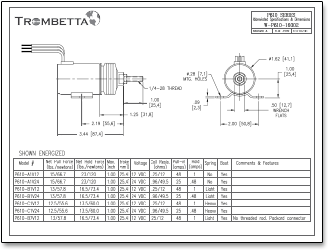 MurCal sells several unique P500 Series solenoids that are popular as replacement/service parts. Designed as a pull solenoid, the P515-A57 offers a solution to meet the needs of the switchgear and valve actuation industries, as well as applications involving packaging equipment, braking, clutching, sorting, locking, cutting, punching, holding and clamping. 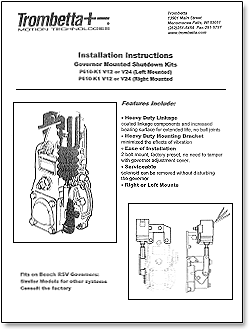 This model is also ideally suited to shutdown your classic Detroit Diesel engine. 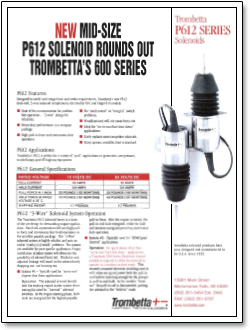 This P515-A66 solenoid was designed for a very specific purpose. 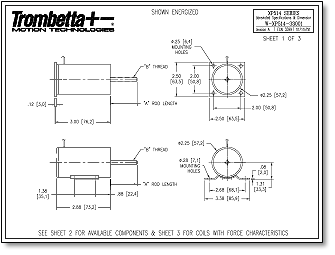 It is now a service part that CNH America or CASE may specify. 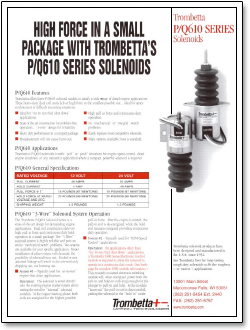 Available specs show the external surfaces of the solenoid to be zinc plated - clear chromate dipped. 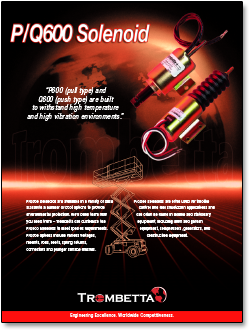 The coil features Class "F" insulation, is oil and dust resistant, with a 4.6 amp max current draw @ 23° C.
The P516-A49 is a solenoid that can be configured with different coils. 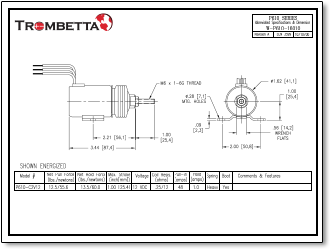 The model we stock has the R05161 coil (the F10228 boot kit is installed, as per photo) which was originally designed to be used with 105VDC, typically with 120VAC going into a Trombetta S500-A300 electronic control module. Approx. length is 10.5" when non-energized. 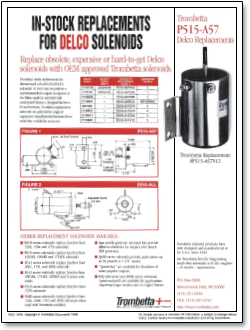 Click here to purchase the P-Series Industrial Solenoids in the MurCal web store.